What if James Bond quit the service, 'M' couldn't be trusted, and 'Q' worked for the bad guys? 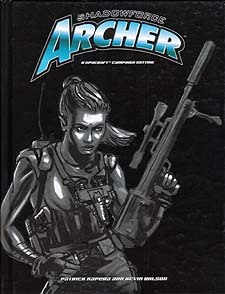 Shadowforce Archer rips back a shroud of conspiracy that has penetrated the highest levels of government for over fifty years, unleashing a thrilling combination of high-octane movie action, psychic spies, mystic artifacts, and ultra-national villain organziations, poised to dominate the entire world, or leave it a pile of smoking ash. You play a shadow operative of the vast Archer Conspiracy, charged with secretly keeping the world safe... from itself. But a superspy's life is never simple. Now, at the dawn of a new millennium, the Archer Conspiracy faces its greatest challenge - a threat from within its own ranks. With its technical wizards gone rogue and Control de-stabilized, no one can be trusted and no place is safe. Are you ready to face the greatest threat the world has ever known? This is not your father's spy game. * Shadowforce Archer is the first official campaign setting for the Spycraft espionage role-playing game. * All the action! All the intrigue! All the secrets! Everything you need to join the worldwide struggle against global self-destruction. * A century of shadow history! Blending real-world espionage events with a detailed and imaginative backstory, the Shadowforce Archer setting is eerily similar to our own, with a fresh and exciting spin! * Eight complete Agencies! Each of the Archer Conspiracy's eight Chambers is detailed, including its background, history, motivations, goals, resources, current plotlines, and feature NPCs. * Cross-genre adventure! Each Chamber has its own unique flavour, representing a distinct genre of espionage role-playing. Highlight subtle differences or play them up for maximum contrast! * New Villain Organizations! Pit your agent team against any of five fully established villain organizations, or use one of dozens of threat hooks sprinkled throughout the setting. * Three new base classes! Whether you play a superhuman physical adept, gadgeteering mentalist, or thought-manipulating telepath, this book contains every rule you need to dive into action. * Five new prestige classes! Play a cat burglar, counter-terrorist, hacker, sniper, or shadespeaker. * Rules for the mystic world and chemical monsters! Explore the wilder side of the Shadowforce Archer setting, or become a part of it. Complete rules for mystic invocations, relics, and the power of chemical augmentation are found inside. * Serialized storytelling with cliffhanger appeal! Play your favourite agents in missions of your own design, or take part in the ongoing official Shadowforce Archer interactive campaign. Requires the use of the Spycraft Espionage Handbook, and the Dungeons & Dragons Player's Handbook, Third Edition.